everal times a day I receive reports of someone committing a violent crime after being prescribed one of the SSRIs [Selective Serotonin Reuptake Inhibitors, a class of antidepressant drugs], Dr. Ann Blake Tracy, executive director of the International Coalition for Drug Awareness, said. Tracy, author of Prozac: Panacea or Pandora?, has investigated the effects of SSRIs on patients. These are people with no history of violent or aggressive behavior and they are now filling our prisons, she said. Richard (not his real name), a 20-year-old student with a 3.8 grade point average and no history of violence, is one such person. Feeling low, apparently as a side effect from a painkiller, one day Richard answered an advertisement seeking subjects for a depression medication study. After he suffered an adverse reaction to the study drug, it was replaced with an SSRI. Under the influence of that drug, Richard got into a fight with another man, even biting off a piece of his ear. The effects of the drug were so extreme that Richard told his father he thought the incident had been a dream. It wasnt. In May 2000, according to Dr. Tracy, Richard began serving an eight-year sentence for the assault. Assassins Eric Harris (pictured) and Dylan Klebold were placed in a juvenile diversion program and attended anger management classes before venting their anger upon classmates and teachers in 1999; Harris was also taking an SSRI drug. The examples reported through the years of lethal violence committed by individuals known to be on psychiatric drugs are too numerous to list here, but include such names as Laurie Dann, Eric Harris, Kip Kinkle, Michael McDermott, Joseph Wesbecker, James Wilson and Andrea Yates. Exacerbating the problem is the fact that psychiatrists have repeatedly demonstrated their inability to recognize and treat the illness of crime. Psychiatrist Kathleen A. Thomsen-Hall, killed in March 2000 by her own daughter, provides a tragic example. Andrea Yates of Texas, who drowned her five children, ages 7 years to 6 months, was on two psychiatric drugs at the time of the 2001 killings, and had recently come off a third. Following the April 20, 1999, Columbine High School shooting**, national electronic and print media carried stories describing how the Columbine assassins, Eric Harris and Dylan Klebold, had completed Juvenile Diversion Programs, including anger management (conflict resolution) and psychological counseling components a few short months before venting their anger upon their classmates and teachers with explosives and assault guns. Harris was also seeing a psychiatrist and taking an SSRI drug called Luvox. The fact that Harris had a therapeutic level of the drug in his bloodstream at the time of the rampage received extensive national media coverage. The package insert for Luvox lists psychotic reaction as a frequent adverse reaction documented during premarketing clinical trials. CNN noted that Satcher declined to address the Littleton, Colorado, shooting last weeksomething he could not do while maintaining a premise that such violence is preventable and predictable when it is well documented that psychiatric drugs introduce unpredictable factors. 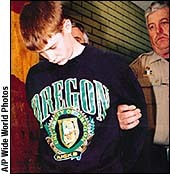 Kip Kinkel killed his parents and went on a shooting spree at his Oregon high school in 1998  killing two people and injuring 22 more. He was taking two psychiatric drugs. Two months after Columbine, Colorado Governor Bill Owens and Attorney General Ken Salazar hosted a Summit on School Safety and the Prevention of Youth Violence, attended by Freedom, to address the high school murders. It was moderated by Barbara OBrien, executive director of the Colorado Childrens Campaign, a group that frequently promotes increased spending for psychiatric monitoring and control of children. The cause of violence, OBrien told the audience, is untreated mental illness. Yet, per media accounts, the two boys whose violent acts precipitated the summit began treatment about 15 months before their rampage. Coinciding with their course of treatment, they began to post psychotic rantings and violent aims on the Internet. Not surprisingly, Ms. OBrien made no mention of these troubling yet revealing facts. © 2001-2008 Church of Scientology International. All Rights Reserved. For Trademark Information on Scientology Services.